Whispers in the Loggia: The Light Is On. For You. Again. The Light Is On. For You. Again. With tomorrow's advent of the penitential season, and reports from the trenches noticing a palpable uptick of penitents, or simply renewed interest in confession, the reminders are circulating that there's no better time for a comeback than Lent. Thanks to a sizable crop of confessions last year, the archdiocese of Washington is reprising its message that "The Light is On For You," with opportunities for the sacrament in every parish from 6.30-8 each Wednesday evening of Lent, beginning next week. Last year the pastoral letter launched both an archdiocesan-wide emphasis on religious education regarding sacramental confession as well as a pastoral initiative entitled The Light Is On For You. 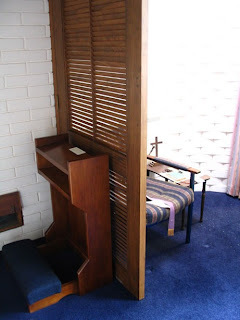 After hearing from the faithful across the archdiocese and in consultation with our priests, it is evident that the initiative was pastorally fruitful and that hundreds or thousands of people experienced the joy of returning to the sacrament of reconciliation, many of whom had not been to confession for decades. In many parishes each successive Wednesday brought more people to church for reconciliation, and in some cases during Wednesday of Holy Week priests heard confessions for three, four or five hours. One pastor observed that "this program awakened a hunger for the sacrament" in his parishioners, prompting him to expand times for confessions on other days and year-round. When asked if they would recommend the initiative again this year, almost eight in ten priests answered in the affirmative. Many of these priests tried to encapsulate why they thought The Light Is On For You was so pastorally fruitful. Above all, of course, like any pastoral effort it was the Spirit who moved hearts to conversion and who poured his forgiveness and his love into countless souls across the archdiocese. In addition, as the Catechism notes and as I recalled last year, the sacrament responds to deep human yearnings which are beautifully conveyed by its various names. Sometimes it is called the sacrament of conversion because it "makes sacramentally present Jesus' call to conversion" (Catechism of the Catholic Church 1423). It was clear last year that the public nature of this initiative, from billboards to Metro posters, brought Christ's call to conversion to so many individuals in our area. One downtown priest noted that many penitents attributed their confession to the visibility of The Light Is On For You. "By simply extending that unique invitation," this priest commented, "their hearts had been touched. In the voice of the Church, they heard the voice of the Father Himself saying, 'Come back home.' And they came!" The sacrament is also called the sacrament of penance because it consecrates a person's conversion, penance and satisfaction. One of the purposes of the initiative last year was to convey both the need and the beauty of the sacrament, as well as to catechize people on how to examine their conscience and to receive the sacrament fruitfully. In this way their steps of conversion and penance were made explicit and consecrated in the grace of the sacrament. One large suburban parish had growing numbers for confession each week, partly due to the pastor's memorable and warm invitation to his parishioners: "If you are still a little frightened, anxious or nervous about receiving the sacrament please do not worry; the priests will gladly walk you through the process. Come and celebrate with your parish priest the great gift of God's compassion." One of the most common names for the sacrament is simply confession because disclosure of one's sins to a priest is an essential part of it. While this self-disclosure can be difficult, it can also be profoundly liberating as we acknowledge our sins and as we resolve out loud to avoid them, through grace, in the future. One priest remarked, "I cannot understand why people choose to walk a life that is less than alive when all it takes is the courage to say, 'Bless me Father, for I have sinned.'" Confession does take courage, but what an extraordinary reward! Another name is the sacrament of forgiveness which refers to its greatest effect, the pardon of our sins and the gift of the Lord's peace. When a pastor narrated his own conversion story to his people, and said that in receiving this sacrament "a great burden was lifted" from his shoulders, it resonated with many of his people. We all need forgiveness since we have all sinned, and the guilt that we bear begins to accumulate and to weigh us down. The sacrament of forgiveness is the Lord's gift to "all who labor and are heavy laden" and to whom he promises rest. "Take my yoke upon you," Jesus says, "and learn from me, for I am meek and humble of heart; and you will find rest for yourselves. For my yoke is easy, and my burden light" (Matthew 11:28-30). Finally, the Catechism reminds us that this gift from God is also called the sacrament of reconciliation since it reconciles sinners to God and to each other in the ecclesial community. Echoing Saint Paul's words to the Corinthians, one priest simply stated that "ours is a ministry of reconciliation." To be reconciled means not only to ask for pardon; it means hearing that the pardon is given. The reconciliation which a priest is asked to mediate, both in the name of God and in the name of the Church, includes both the admission of guilt on the part of the penitent and the audible forgiveness on the part of the priest. In this sacrament we enjoy the explicit confirmation of forgiveness, suited perfectly to our own human desire for reconciliation, and an enduring proof of God's unfathomable love for each of his children. The most important blessing of The Light Is On For You, then, has been the spiritual healing and sacramental forgiveness of so many people across the archdiocese. However, this pastoral program has also highlighted the sacrament of confession in a public way and given an important witness to our neighbors about the importance of God and our need for his help and his mercy. If this pastoral initiative can enkindle in some a renewed desire to seek the Lord who is the only answer to their silent yearnings, then I believe it will have been a success. By whatever name one wishes to call it — Confession, Penance, Reconciliation — and in all the varying forms it has assumed throughout the ages, the underlying reality of this sacrament remains the same: it is the privileged way in which our desire to be healed meets God’s desire to heal us. Therefore, I want to issue this invitation to the people of the Catholic Diocese of Saginaw, and to all people of good will: come to the sacrament of Penance. Come to know the particularity and depth of God’s healing love for you. Come to meet Christ, the Divine Physician, and receive the healing love he offers.